With influences like the Who, Avenged Sevenfold and Cheap Trick, you might end up with a band like Scattershock? or not. We started making music in high school, inspired by the 70s and 80s Bay Area music scene. That eventually led to gigs at the usual places, the pursuit of other interests and us going our separate ways. But somehow, we always got back together and made more music. 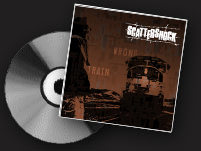 The songs of Wrong Train weave together our stories, gathered and experienced over the years, everything from the burden on our shoulders to love, desire, scorn and ultimately, redemption. Our imprint on the product is as deep and broad as it gets, with a path that was crooked but worth every twist and turn. Doing this ourselves was the only way to satisfy our creative urges and experience every part of the process. From recording tracks in Denver, to editing and recording vocals in the Bay Area, to mixing in Montana and finally mastering everything back in the Bay Area. In the end, it's been worth it. We like these songs, the way they turned out and we are damn glad to show them off to you.